Back cover blurb: What you would do if your husband became another person overnight? A tragic accident. A terrible injury. And in a moment the man you fell in love with, that sweet, caring, charming man, is transformed into a total stranger. One who snarls and one who shouts. And one who doesn't seem to love you very much at all anymore. You swore to love each other in sickness and in health, but how would you cope? What would you do? And would you be strong enough to stay? Molly Fraser wishes her husband would return to her. The smiling, happy, loving, romantic man of before. It isn’t that they have fallen out of love exactly. More that Alex can’t actually remember how to love his wife. Following a devastating accident three years previously Alex suffered life changing brain injuries. Physically he is fine, emotionally he is confused, frustrated, angry, impatient and doesn't understand why he can't do the things he used to. The truth is, he forgets where is, loses his temper at the slightest thing - he is volatile. And Molly for the first time in three years is scared as Alex's behaviour worsens. Her immediate thought is to turn to Alex's twin, Graeme (Gray) for help. The twins weren't always there for each other, but after the deaths of their parents they have made more of an effort and can now rely on each other. Just as Alex's behaviour begins to deteriorate further Molly's parents throw her a lifeline. An offer for her and Alex to move into an annexe, yet to be built, at the bottom of their vast garden. Molly is hesitant. What would Alex do all day at her parents? At least where they are now Alex can do some mundane daily tasks without getting in to too much bother. She needs time to think things over, and then Alex lashes out, the angriest that Molly has ever seen him and she is suddenly afraid. She still loves him dearly. But he is not the man she married. Will she ever be again? Molly is scared, her husband, a stranger. 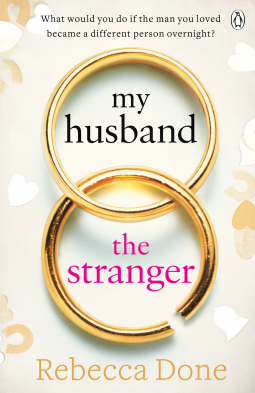 My Husband The Stranger is available now via Amazon online and all good book shops.